STEAM learning is a passion of mine. I know it is for you too! 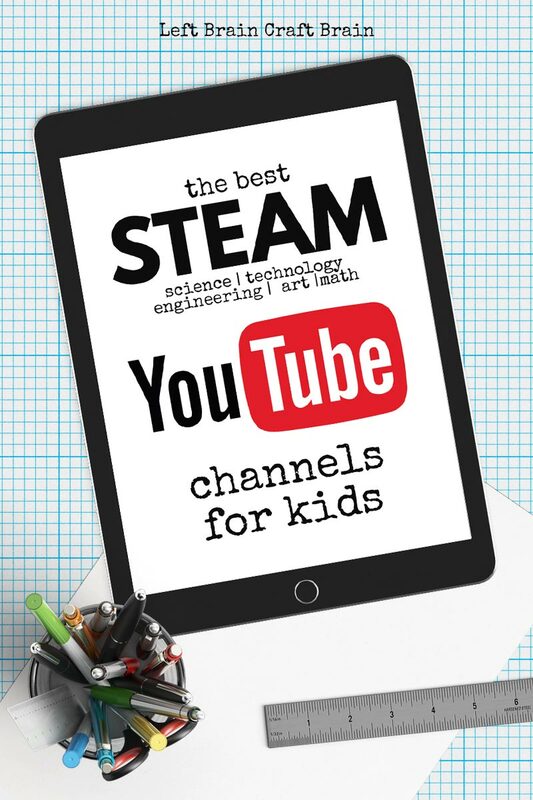 There are so many really amazing resources out there to encourage learning for your STEAM kids and today I want to share the best STEAM YouTube channels for kids. As educators and homeschoolers, we know there are people out there can explain concepts more effectively than we can. AND our kids, without a doubt, would love to watch anything on the screen! Tap into your child’s attraction to videos and educate them! This set of channels are great for kids of all ages. 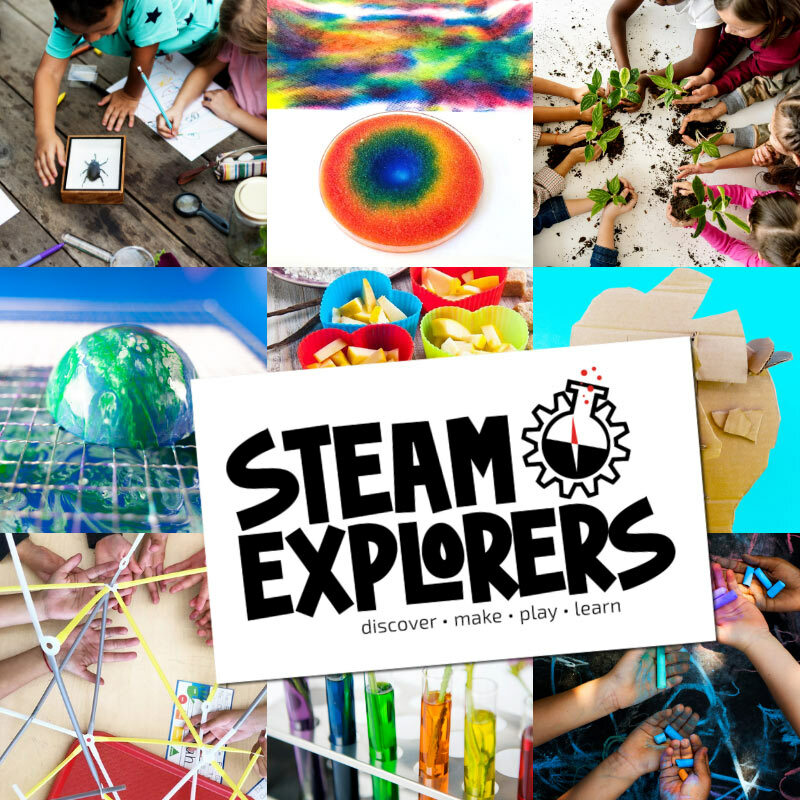 Find science experiment inspiration, art lessons, fascinating math concepts, and a whole lot of fun! 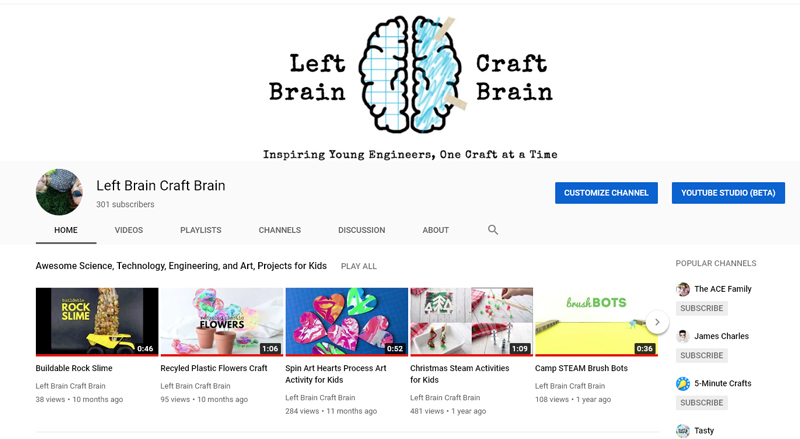 First up, you’ll definitely want to follow Left Brain Craft Brain on YouTube!! You’ll find cool engineering, fun science, and amazing art inspiration for you and the kids. There’s no doubt Steve Spangler is awesome! If you are into hands on science, he is your guy. Not only does he have amazing kits to make it easy, he shows you step by step in his videos how to complete each experiment safely. Your kids will be memorized! Science is FUN! The Backyard Scientist proves this over and over again with amazing demonstrations that will inspire and educate. This channel has over 2 million subscribers. Take a little time to check out your favorites like the unexpected reaction which happens when you pour molten aluminum into a watermelon! Tap into your artistic side with Red Ted Art. I LOVE this channel! I always find amazing inspiration for beautiful art with step by step instructions. It’s actually really hard to find a great channel that integrates art with STEM. Babble Dabble Do does it with style! 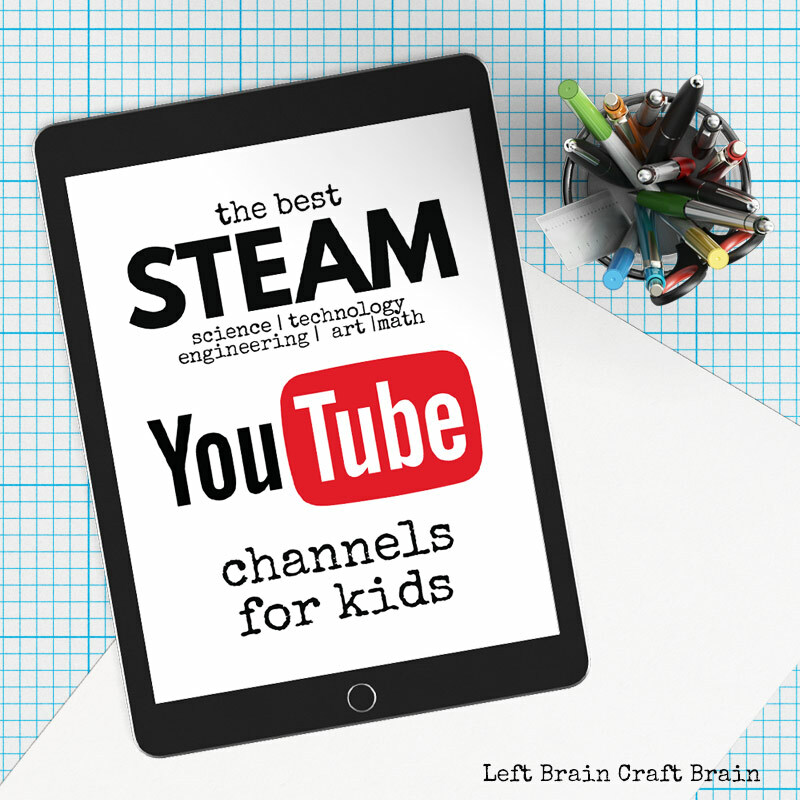 If you are a beginner at introducing STEAM to your kids, this is the channel for you. The lessons featured each week are simple and easy to implement at home with any amount of space. Creativity is just a click away! The creative puzzles on this channel are amazing. Wow your kids with how to make a circle into a square! There are so many amazing ideas here to boost your homeschool curriculum and encourage creativity. Wow! This YouTube channel has EVERYTHING! The brothers of Crash Course educate and entertain while they break down so many amazing topics into educational videos. This is the perfect channel to introduce new topics to your little learners or review concepts for your older kids. If you are looking for great lessons for your art time at home, MontMarteArt is where to start. The videos here also have lesson plans you can download and additional outlines to make teaching lessons easier. Need a reason for kids to be interested in the STEM world around them? Check out STEMbite. These videos are bite size. Only 2-3 minutes long. The science teacher uses Google Glass to show exciting science that surrounds us every day! Science doesn’t get much more exciting than with Sick Science! Another channel for Steve Spangler focusing on simple science experiments you can do at home. TinkerLab is the perfect channel for creative kids. There’s a lot of art, science and engineering creative products for maker kids. This Dad is rocking art with his kids! Art Hub for Kids is all about step by step instructions on how to draw specifics topics, paint beautiful creations, and fold origami. The view of the videos are perfect for kids to watch, pause, and create! This month I’ve joined in with a crew of bloggers, parents, and teachers to gather a wealth of information all about STEM & STEAM. Each day will be a different topic to check out. 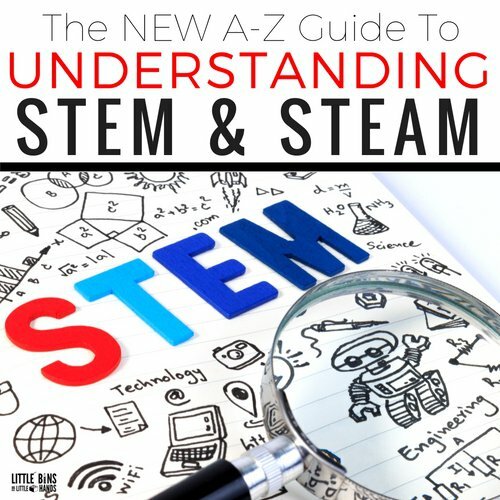 In fact, we had a little fun and turned it into an A-Z guide: The New A-Z Guide to Understanding STEM & STEAM.